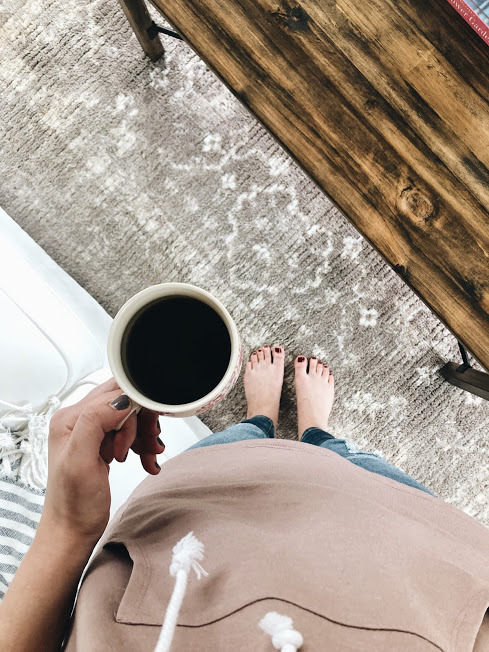 Now, it is true that the first time we walked into our now home we both thought, “yikes, cream carpet.” Not our first pick of flooring and we were moving in with a dog and a kid and, well….me, who is known for the greater amount of spills in our home. We knew this carpet was going to quickly gain the look of well-worn. Yes, it’s been impossible to keep fully clean. Yes, we can’t wait to change it one day. Yes, there’s nothing wrong with excitement in that plan. This attitude, though. This attitude was springing from a much deeper place in my heart. A place where I wasn’t satisfied. A place where gratitude was not even a fleeting thought. A place where I told myself that changing our flooring was a key to contentment in our home. This portion brought the tears to my eyes because I saw it’s truth ringing loudly in my own heart. I saw all those moments of complaint about our carpet, the moments of comparison to those around me, the moments of making more of a material thing than the ones who the Lord has gifted me to live my days with, the moments of making much more of the undeserved graces He’s provided for me than of Him, the One who has given me my very life. I needed this heart check. I needed this accountability. I needed this purposeful set-aside time to not just have a spending fast of sorts, but to plumb those heart depths a bit and consider what sat under those discontented thoughts, those moments of annoyance, that reasoning of why I needed to purchase that particular thing. So here I am, 17 days in, and loving it. It has been so freeing, friends! More than I imagined it could be. Freeing because I’m just not thinking about purchasing new things, but freeing because I’m seeing the Lord purge those sinful pieces of me and redeem them into what is better. It’s freeing because I’m learning to slow down and consider every single purchase. It’s freeing because I’m excited about staying within those budgets set up. It’s freeing because I’m learning how much is actually needed and how much is purely just for want. It’s freeing because I’m learning all the more to find beauty in simplicity. It’s freeing because I’m learning more of what is lasting joy, of WHO is lasting joy. This has been the best way to start my year. There have absolutely been moments of struggle. I will share more of those soon. But it has been far better than it has been hard, and the timing of it is so beautiful, in that way that only the Lord can do. I’ll also share on that, too. It’s a marker in my life.